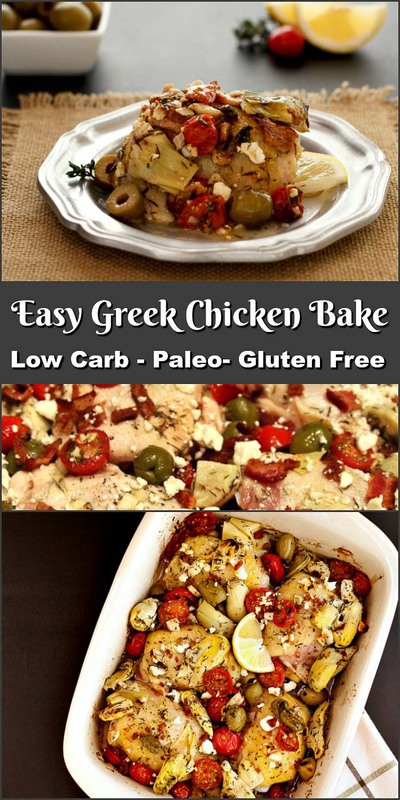 Easy Greek Chicken Bake is simple to prepare, delicious, Greek-inspired chicken dish that is grain free and low carb. 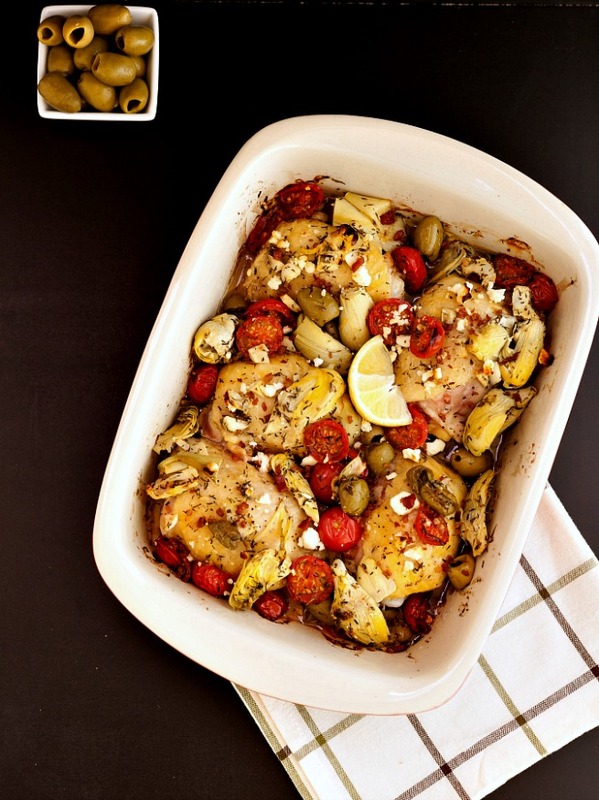 Easy Greek Chicken Bake is a low carb, grain free, paleo, one pan wonder meal! This is a super easy meal and packs awesome, Greek-inspired flavors. Don’t you just love it when you can dump all the ingredients in a pan and pop it in the oven and walk away. My family was really impressed with this dish. My Hubby even called dibs on the leftovers, and he is not even a chicken fan. Must be the bacon, lol. Even though one of my kiddos does not like olives, he still ate it and just avoided the olives. I had told him that I just can’t make Greek food without olives because it would be a culinary crime! 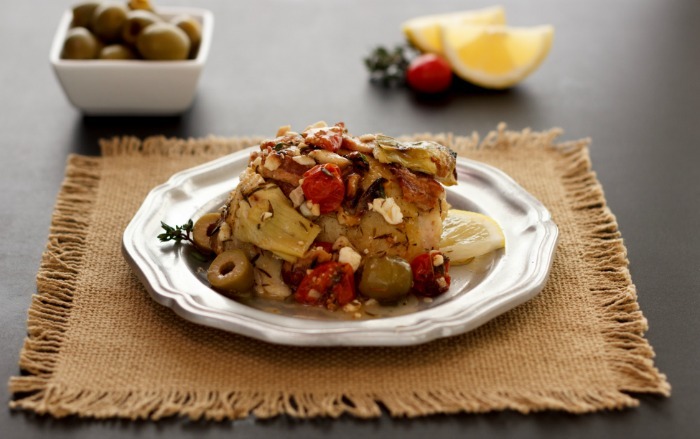 An easy, delicious, Greek chicken bake. Preheat oven to 425 F. Place chicken skin side up in a 13 x 9 x 2 inch rectangular baking pan. Sprinkle chicken with sea salt and black pepper. In a large mixing bowl combine: tomatoes, garlic, olives, artichoke hearts, thyme, lemon juice and olive oil. toss to coat veggies. Pour veggie oil mixture over chicken. Sprinkle chopped bacon and feta cheese over the top. On top oven rack, bake for 40 to 45 minutes and until a thermometer reads 165 F or above when inserted into a thick part of the chicken thigh while avoiding the bone. Made this last Sunday sooo delicious. Served it over brown rice. The sauce has amazing flavor. Next time I will crisp up the skin before baking. Will make this often. Do you think I could turn this into a freezer meal? Obviously I would have to tweak the time cook, but do you think it’s posssible? Ciana, yes, I think it would be a good freezer meal option. Let me know of your results if you try it. 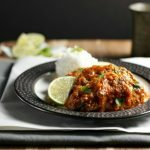 My family does not like chicken thighs, can I substitute white meat? Neva, yes chicken breasts also work in this recipe. So delicious! This will be in our recipe bi-weekly rotation. Hubby loved as well! Used Prosciutto instead of bacon (in error) and still yummy. Can’t wait to try more recipes! Thank you Tracey for your very kind words and review. Prosciutto would be excellent in this! Tried this tonight and it was great. My husband who is very picky even loved it .This is definitely a keeper! ! Sandy, Thank you so much for trying the recipe and the kind review! So glad it has your husband’s thumbs up. My hubby loves it as well, even though he is not fan of chicken (he thinks all recipes should be made with beef, lol). These are all of my favorite tastes in a chicken dish. I love it and the video. I’ll have to admit I’m not an olive fan either, I don’t know why I’ve never enjoyed them, but this looks so flavorful I’ll never miss the olives with so much goodness going on! Kari, yes you can leave them out. 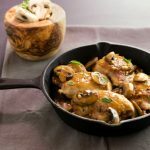 I love love love one-pan meals and this chicken looks heavenly! 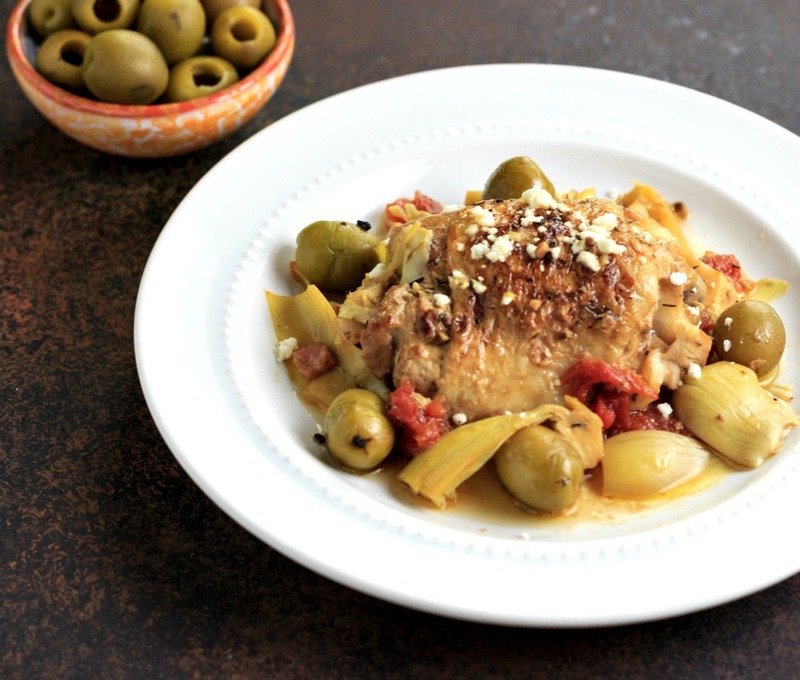 The Greek flavors really do magical things to chicken and this looks like a great meal to have on the menu for a busy weeknight! I am not an olive fan, but I agree about leaving them out of greek food being a culinary crime! I will have to pick out the olives just like your son (I can’t seem to enjoy them no matter how hard I try!) but everything else here looks too delicious to pass up. Becky, You can make it without the olives, lol. This is one of the most beautiful things I’ve cooked in my whole life. (I am 61 and a lifetime home cook). So easy, so tasty, I will make it again and again. Thank you for sharing it with me. I rate it a gazillion out of ten. Denise, thank you so much! That is the nicest comment I have ever received 🙂 You’re sweetheart of a lady, and I can’t thank you enough. This looks so good and I love that it’s one pan! I’ll definitely be trying this! I LOVE greek food! What a great bake that includes all my favorites. 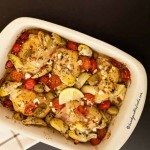 Baked chicken is always a favorite in my household and you just made it look so simple and delicious ! This looks so good! Chicken, bacon AND feta. My family is going to LOVE this! I love one pan meals! This looks so tasty! This sounds amazing. I have to remove the nightshades, but I’ll bet it will still be a winner. Yum! Thanks Cristina. I’m thinking it could be made without the tomatoes. This sounds so delicious! I love Greek inspired meals! LOVE all of those olives and artichoke hearts! Love all those olives! Thank you for the great dinner idea to get on the menu next week! I have made this dish several times since I found it. To make it more Greek, I use pitted kalamata olives, and use Greek seasoning in place of the thyme. My family loves it! 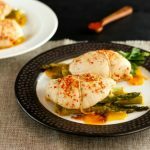 I use boneless, skinless, chicken breasts and double the recipe for everything else. Serve it on top of garlic mashed potatoes. So tasty, and have leftovers too! My grown children have asked for the recipe as well. WOW! Made this for dinner tonight. Super easy and delicious! So much flavor. I had to sub a few things for what I had on hand (boneless, skinless chicken thighs, hearts of palm for artichokes, goat cheese for feta) but it still turned out great. Baked for the full 45 min and chicken did not dry out at all. THANK YOU so much for this wonderful recipe! Mandi, Thank you for trying the recipe and for your kind words. 🙂 I am thrilled that the boneless chicken could be baked that long, as I always have boneless chicken in the freezer. Was it frozen? The chicken thighs were not frozen, but I have found chicken thighs to be very forgiving. I have read that chicken can be placed in the oven frozen, although I have never tried. I use frozen chicken in the oven quite often. I discovered this recipe about 3 months ago and have made it almost every week since then. It’s wonderful and so easy to make. My husband is totally in love with this dish!! I use black olives but I’ve used both black and green ones combined. Yummy!!!! Amanda. Thank you for making the recipe weekly, and taking the the time to leave an extra nice comment. I like it with mixed (green and black) olives too! My hubby loves it, and my kids pick the olives out, and then eat it, lol. Heather, Yes this can be made with boneless chicken but you will need to shorten the baking time, as boneless cooks faster. This looks wonderful! How well do you think it would work if I used black olives instead of green (I just prefer black). I’m going to stop by the store on my way home from work to pick up the chicken….I have everything else! Pam, sure black olives are fine. I just had green ones on hand. Wow this was SO good! My hubby and I had it last night for dinner, and we made another batch tonight for during the week. It’s THAT good and easy! Made this tonight! It was DELICIOUS and relatively easy to put together! Also looks quite fancy for how simple it is :). Awe thanks Cynthia. It was very kind of you to take the time to leave a nice comment. 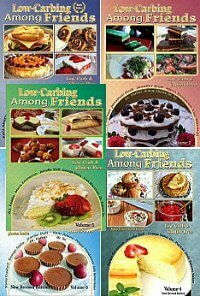 Thank you for so many lovely recipes! 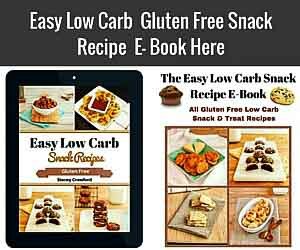 The carb counts are so necessary, as my 5 year old granddaughter has type 1 diabetes. Please clarify: shall I utilize “net carbs” when calculating insulin dosages? 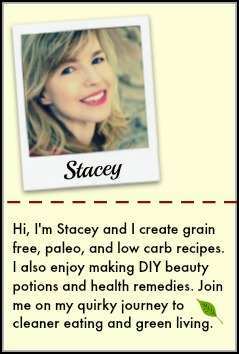 Thank you Stacey! Hi Mary, I found an article by a Diabetes expert that answers your question better than I can. 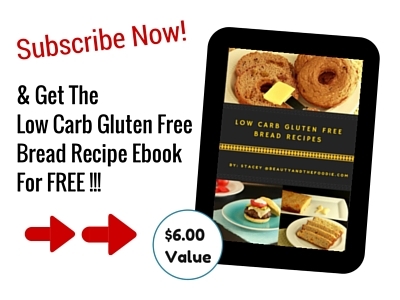 Here is the link: http://www.diabetesforecast.org/2014/12-dec/what-are-net-carbs.html She says most count total carbs, but some do subtract fiber and 1/2 sugar alcohol grams. Thanks Tash, My olives haters picked them out of the dish. That is why I did not chop them up, so it would be easier for them to eat around them. Hi Stacey. This looks really good. I don’t like skin left on my chicken. Can I take it off before cooking? Dianne, yes you can take the skin off or purchase skinless chicken for this recipe. Possibly may have to adjust cooking time slightly. Sounds yummy! Do I need to cook the bacon before adding to this recipe? Deana, you can use uncooked (raw) bacon, or precooked bacon. It is in the oven long enough to cook the uncooked bacon along with the chicken.